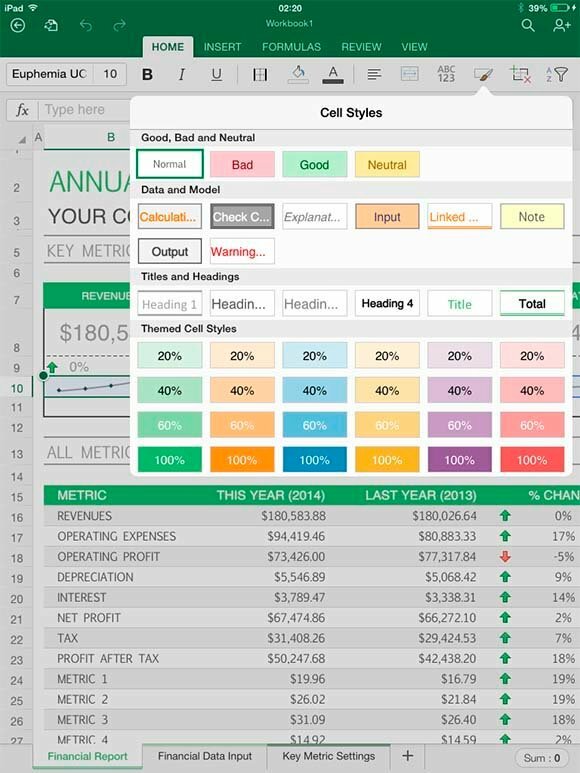 Office for iPad: Working with cell styles in Excel - Test drive: Is Microsoft Office for iPad a strong start for mobile Office? Getting documents in and out of Office for iPad is complicated by the lack of a traditional file system in Apples iOS. You can open and save documents from SharePoint, Office 365, OneDrive consumer cloud storage, or on the iPad itself. You can also edit emailed documents, and attach documents to emails. Support for competing clouds such as Dropbox or Apple’s iCloud is not included, other than via the “Open in Another App” feature in the OneDrive app, which opens a standard iOS sharing menu. All the pieces are in place, but during the course of this review I did see some odd behaviour from OneDrive with changes saved from a PC not appearing on the iPad. Problems like this are hard to troubleshoot and it would help if Microsoft offered more diagnostic tools in its cloud storage clients. The quality, performance and capability of the Office for iPad apps exceeds expectations, and the subset of features is well chosen for productivity without clutter. Microsoft’s decision to restrict full features to Office 365 subscribers will limit take-up; it seems harsh on businesses that have invested in on-premise SharePoint and Office (perhaps a way will be found in future), but does form an attractive bonus for those with the right Office 365 subscriptions. Microsoft has proven its ability to create strong apps for Apple’s mobile platform, and shown that it will support its cloud services on non-Windows devices despite the risk of undermining the advantages of Windows clients, though it now needs to follow up with an equally strong Android suite. Given the diversity of today’s client landscape, the new strategy makes sense and makes Office 365 correspondingly more attractive.